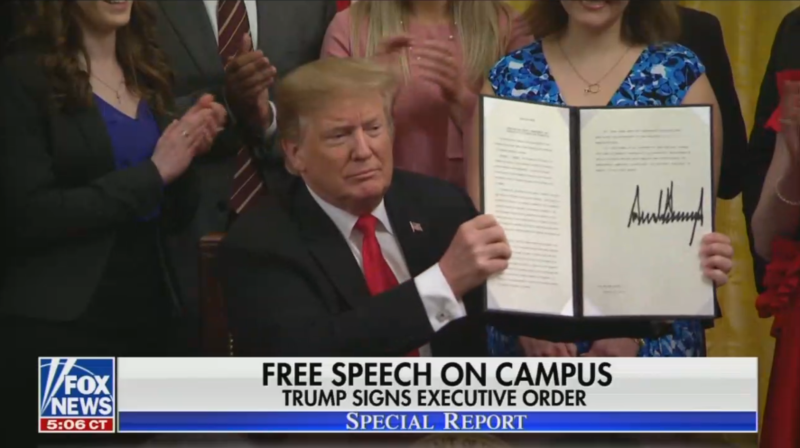 In a highly anticipated ceremony on Thursday, President Trump signed an executive order directing his government to take action in protecting free speech on college campuses. It wasn’t something that enthused the liberal broadcast networks (ABC, CBS, and, NBC) so they omitted it from their evening broadcasts. Instead, they all cheered on New Zealand for their swift movement in banning so-called “assault weapons”. So, that’s two rights the liberal media seemingly don’t like. Roberts added that, “The move follows incidents at several colleges and universities where conservatives have been targeted, including UC Berkeley were a student, Aidan Williams, was punched in the face for supporting the President and conservative policies.” And it was something Trump talked about doing at CPAC this year.